Hey Everyone! Just wanted to show off a recent layout. I love this picture of the kiddos and have scrapped it before. It is really hard to get both of them in one frame unless there is hitting, pushing or screaming involved. 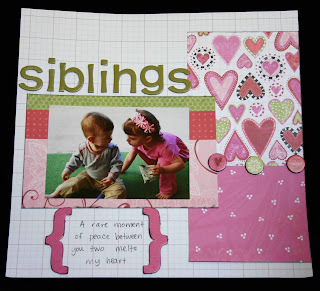 The supplies used for this layout were all from Scenic Route except for the adhesive (3M and Glue Dots), ink (Colorbox) and pen (American Crafts).